These Maple Garlic Roasted Carrots are incredibly tender, bursting with flavour and are topped with a delectable Carrot Greens Chimichurri. 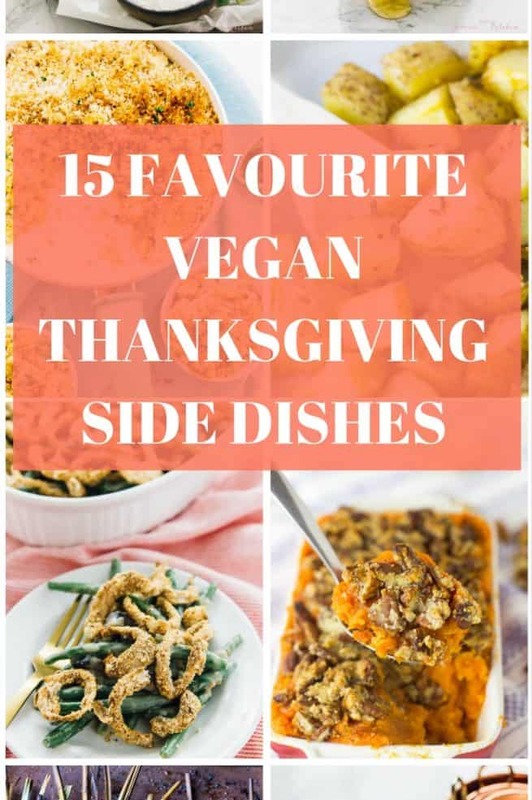 They make a perfect side dish to any meal! I think it’s safe to say that the happiest part of my Saturdays are going to the farmer’s market. I love the new, organic, imperfect finds, and I think they are pretty symbolic of life itself: beauty in the flaws. 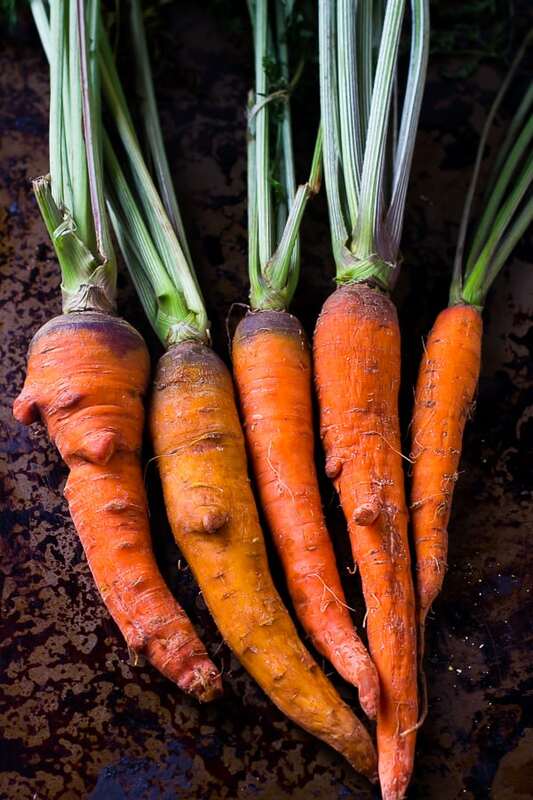 These carrots were among my last farmer’s market’s finds and when combined with the glorious combination of garlic, maple syrup, coconut oil and thyme, produced the most fork tender, flavourful and divine roasted carrots I’ve ever had the pleasure of tasting. The real star of this recipe? The carrot greens chimichurri. Mind. Blown. It was a bittersweet moment cooking these carrots. They were sitting pretty in my fridge, given the top shelf glory spot, speckled in various shades of orange and purple for only two days before I remembered that they weren’t actually decoration. Some people might dislike the bumps, bruises and odd shapes but that’s exactly what drew me to them. I knew that I wanted to make a dish that was simple so as to preserve them in their natural state but to completely enhance their flavour. Roasting vegetables is kind of a no-brainer when it comes to that. A few cloves of garlic and a mix of maple syrup, coconut oil and thyme later, these roasted carrots were born. Out came a sweet and savoury, completely fork tender piping hot bite of heaven. They are lit pieces of candy. Then came the carrot greens chimichurri which I have been putting on every. single. thing. 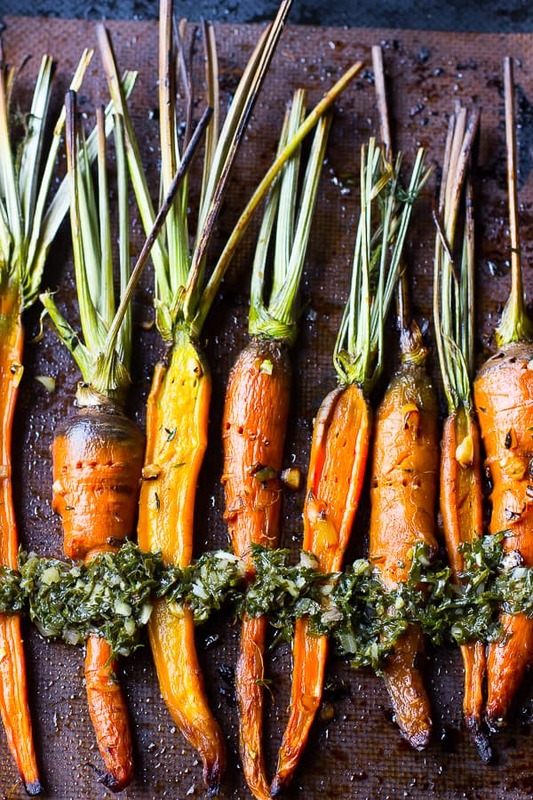 I have been a fan of chimichurri for a few years and knew it would pair perfectly with these carrots. I thought it would be nice to try and utilise the entire carrot. After all, it’s all entirely edible. Carrot greens resemble parsley and cilantro and are like their thinner cousin. I washed them like I would any other herb, mixed in some chimichurri-esque ingredients (red onion, vinegar, garlic cloves, olive oil, lime and red pepper flakes) and left it to set. In case you’re wondering YES, the Mr. and I DO go through about 3 heads of garlic per week minimum. Sometimes I think my blog should be called Garlic in the Kitchen. 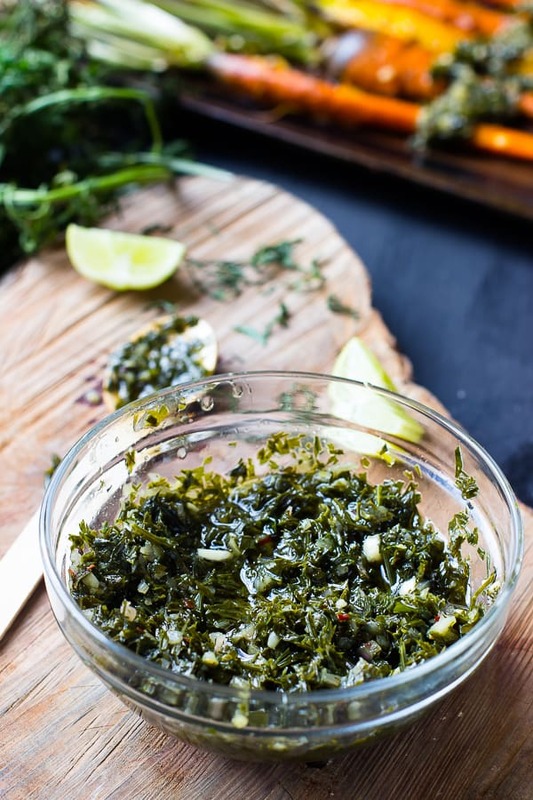 This carrot greens chimichurri has probably been one of the best spreads I have ever tried. 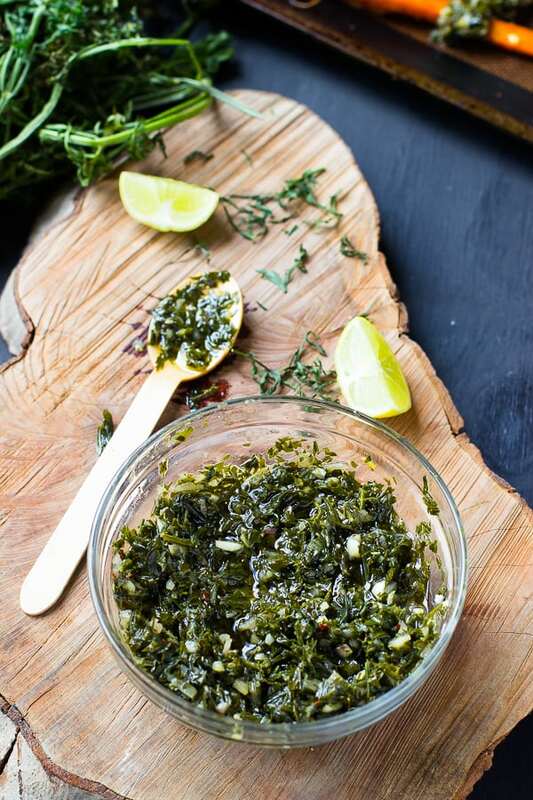 I am a lover of all things brine-y, and it captures everything that is a classic chimichurri. You wouldn’t even know it wasn’t parsley or cilantro. Two hours after I made it it tasted even better after the flavours got some time to marry, and the next day significantly more divine. I would recommend making the chimichurri first so that it’s at its max potential when it’s smothered on your carrots. P.S. – put it on everything. I had a carrot greens and vegan goat cheese naan bread pizza for dinner, I’ve been putting it on homemade bread, crackers, eating it with a spoon…you name it. It’s divine with a capital D.
Roast for 15-18 minutes in the oven, watching to ensure they don't burn. Remove and allow to cool slightly. Season with salt if necessary. Top with the chimichurri. Enjoy! If you try these Maple Garlic Roasted Carrots with Carrot Greens Chimichurri, please let me know in the comment section below, or tag me on instagram with the hashtag #jessicainthekitchen! I love going to farmer’s markets, too! Unfortunately, they won’t be around where I live until at least May, but that’s ok. These carrots look gorgeous! I love the maple and garlic flavor. Perfection! Hi Jessica, always a pleasure to pop over to see what you’re up to in the kitchen. These carrots look delicious. I really enjoy your food styling and photography. Very inspiring. Pinning this. And only 3 heads of garlic a week 😉 Ha! Garlic is a must at our house too! Thanks Kristen! Haha I need to start investing in it! Garlic and maple…I have no double these roasted carrots would be a hit in our house! They definitely would be Angie! 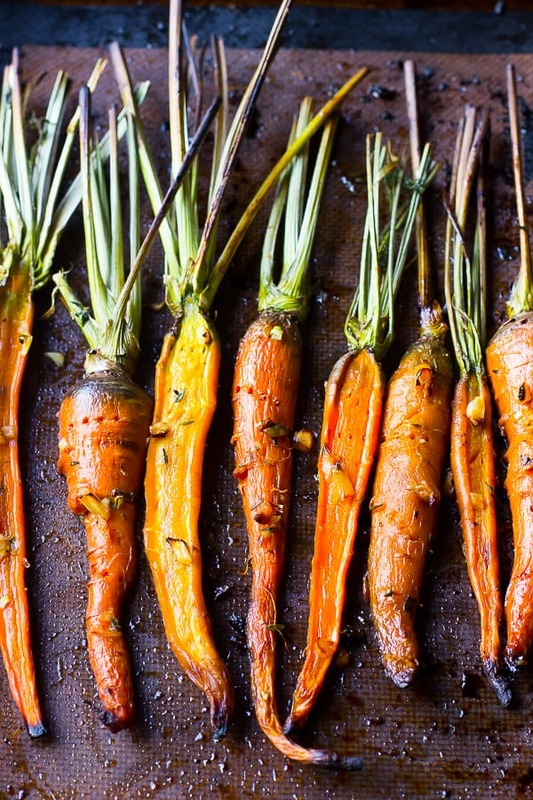 I’ve been roasting rainbow carrots so much lately — we can’t get enough! 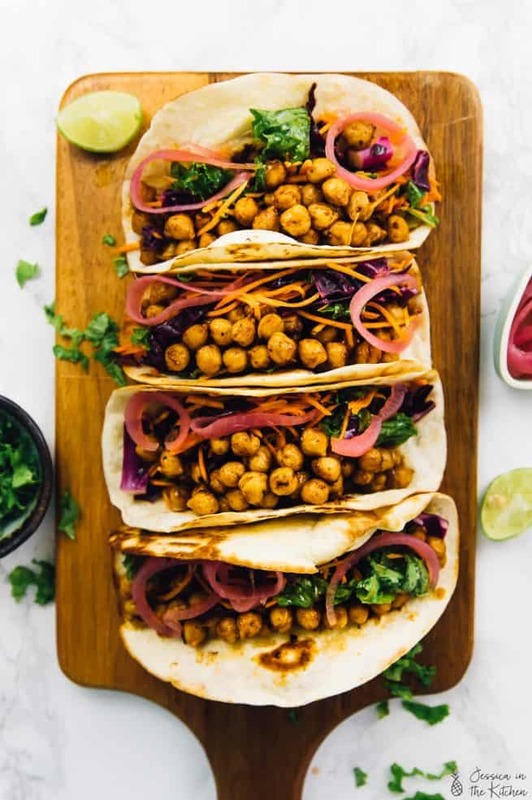 These are so gorgeous and I love that you used the carrot tops for chimichurri! 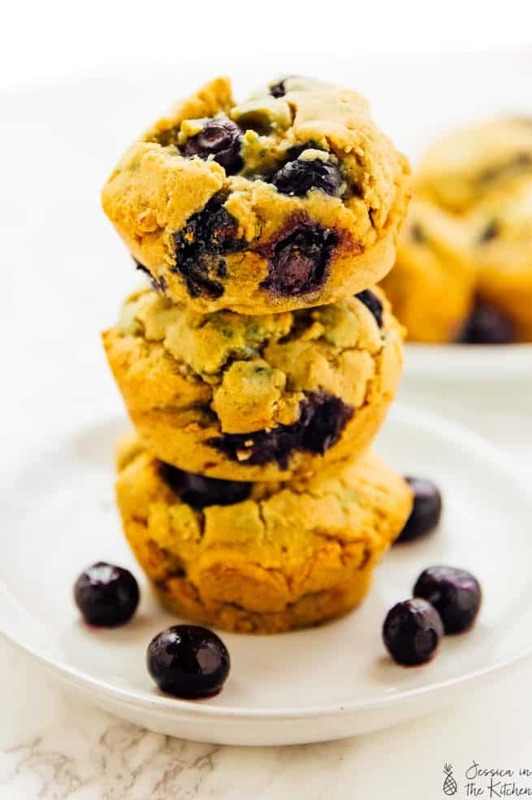 Stumbled across this blog when I was looking for carrot green recipes. Is there a reason maple syrup isn’t listed in the ingredients? Would love to try the recipe but I don’t think it’s going to turn out as posted, thanks!